The latest light-curve for Comet ISON (compiled November 04, 2013 by Matthew Knight). As of this morning, comet C/2012 S1 (ISON) was 0.8AU (74-million miles, 120-million kilometers) from the Sun, and zooming along at 47km/s (105,000mph, 169,000kph). By Monday evening it will be inside of Venus' orbit (not physically near Venus, though). We now only have 20-days until ISON reaches perihelion, at around 18:36UT on November 28, 2013, but we still don't know if it will reach there and - if it does - how long it will last! In our previous update to this page we commented on a mixed bag of data that heralded both good and bad signs for comet ISON, and raised many questions. Is its dust production rate flattening out, or even tapering off? Or is it dramatically increasing? Or perhaps increasing but not at the rate we'd expect from a comet so close to the Sun already? The comet is clearly still in one piece as of a few hours ago, but how long will that last? Days? Weeks? Indefinitely? All of these are valid questions, and depending on who you ask, you will get a slightly different response. Comet ISON is being a particularly odd comet, but this is a good thing! We always felt it would be an interesting object, hence this high-profile observing campaign, and that hunch is paying off. We have an unprecedented array of telescopes pointing at this dynamically new comet, and when the show is finally over (whenever that may be), we will begin to put the pieces together and gain a very complete understanding of this object. Again we urge everyone to read Matthew's latest blog post about what we might expect over the next couple of weeks. Today there are two results we'll highlight very quickly. The first is one that we mentioned already - namely that the Chandra X-ray telescope made some successful and very interesting detections of comet ISON in EUV and soft x-ray wavelengths. Those observations were spearheaded by the CIOC Chair Casey Lisse (who actually first discovered X-ray emission from comets), and they will absolutely be detailed on this website in the coming days. 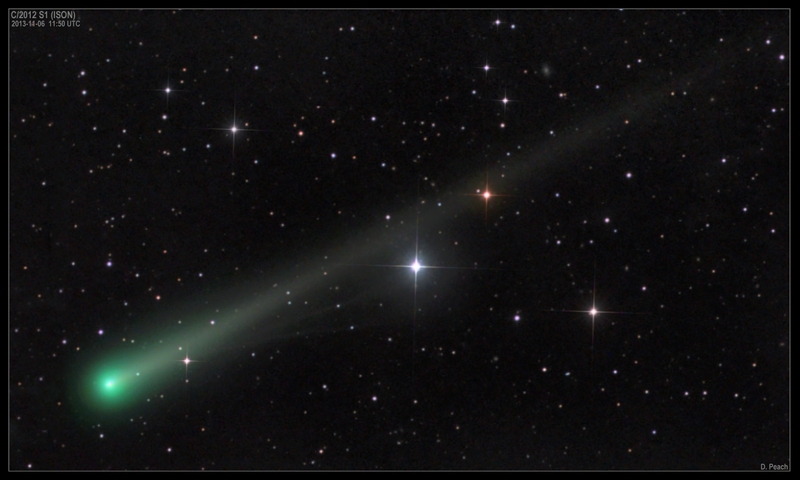 The other really nice result is yet another jaw-dropping image of comet ISON by astrophotographer Damian Peach. This one is particularly nice as it very clearly shows the new structure in ISON's tail that we recently mentioned. This new feature, which you can see as a fork (actually two forks...) below the main dust tail, is an ion, or gas, tail. We see these all the time in comets, and they are a consequence of solar ultraviolet photons stripping electrons off of the neutral gas that has been released from the comet via a process we call ionization. As ISON gets closer to the Sun, we hope to see some interesting interactions between its tails and the solar wind. Now we're around perihelion time for ISON, we will update this "Current Status" page more frequently -- in some cases daily. Check back regularly for updates, and follow the CIOC's Karl Battams '@SungrazerComets' Twitter feed for more CIOC, ISON and comet news.